A full life demands a passionate response, and that means taking risks. What’s important are not the risks, but what we take them for. I went to sea when I was barely seventeen, spending a summer in the Far East. No fancy container ships then. I was on a freighter with 50 tough seamen determined to teach me the lessons they knew I’d never get in school. The next year I sailed into Boston Harbor just in time for our freshman orientation. The next summer, seven of us from the Harvard Mountaineering Club did the first direct ascent of the north wall of Mount McKinley, a climb so dangerous it’s never been repeated. 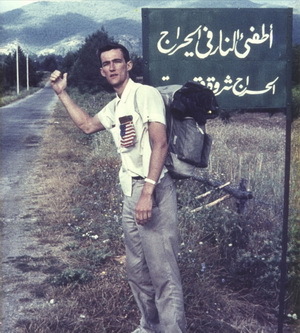 After graduation, I hitchhiked around the world, writing stories for the Boston Globe on every war I could find along the way, from Cyprus to Laos. I was thrown out of Saudi Arabia for trying to sneak into Mecca. I was jailed in Iran as a spy. You get the drift. By age 23, I’d created a very simple philosophy of life. First, nothing mattered but adventure, and the bigger and more dangerous the better. And second, I was indestructible—none of the risks I took would ever do me in. That this guide for living was shallow beyond belief did not occur to me. I was, after all, a Harvard man. But now I had a problem. How could I keep up my adventuring and also make a living? I decided on the Foreign Service, and it didn’t disappoint. I was in the middle of the (first) revolution in Libya; then, in 1971, I went to the war in Vietnam as Advisor to the City of Hué, still recovering from the Tet Offensive of three years before. I was trapped in that City in May 1972 when the North Vietnamese attacked it again. All American ground forces in the area had been sent home and the South Vietnamese units defending it were crumbling. Panicked Vietnamese would mob any helicopter sent to pull the few American advisors out; we’d have to shoot them off the skids, and they they’d be shooting back. The night of May 2 the City was jammed with a quarter-million refugees fleeing the fighting to the north. Deserters from the South Vietnamese Army were looting abandoned shops. The marketplace was in flames, covering the City in a pall of black smoke. Bombs and artillery crashed and boomed. Glass shattered. People screamed. Most City officials had fled south. My job was to help set up martial law to restore order. I went to the Mayor and slammed my fist on his desk demanding he set up a firing squad to start shooting the deserters—even though I knew that they were mostly farm boys dragooned off their rice paddies a month or even a week before and scared out of their wits. Then, suddenly, another awareness hit me like a bullet. I’d never believed in America’s aims in Vietnam. I knew we were losing and didn’t much care. I was in Vietnam for the adventure, and now, as I rose in rank, the power. I had no idea if a firing squad would help restore order. To me, the war was a game and I was playing those farm boys as pawns. I stopped my fist in mid-swing and turned on my heel. How had I allowed my life to become that shallow, that irresponsible? Three execution poles were erected on the riverbank that night. The next morning dawned clear and American Navy jets crushed the advancing North Vietnamese columns. Once again I’d escaped a violent death. I don’t know if anyone was shot at those poles and I live with the image of them, stark on that riverbank. Back in Washington, the State Department kept promoting me, but now the promotions sat in the pit of my stomach like a bad meal. Something was missing. 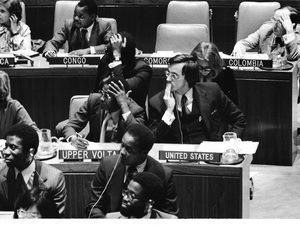 In 1977 I was posted to the US Mission to the United Nations in New York, where I got the chance to play a key role in Jimmy Carter’s human rights initiatives. To my surprise, I soon found myself risking my career repeatedly to push traditionalists in my own government way farther than they wanted to go. Battling against apartheid in South Africa, I realized that these peace and justice initiatives were the meaning of my life; I’d found that meaning, not in adventure or power, but in using my skills and experience to help solve terrible public problems, making the world a better place. Loving this new way of being in the world, I saw that I could not stay in the Foreign Service, whose objectives were increasingly divergent from my own. So I quit. There I was, with a head full of ideals and totally naïve about the obstacles and the need to make money. With two kids and an impending divorce, I soon was broke and scared. Then I heard about how much I could make lecturing on cruise ships. I signed up and soon I and my then 13-year-old daughter Malory boarded the cruise ship Prinsendam, headed from Vancouver to Tokyo. Three days out of Vancouver, that ship caught fire in the middle of the night. For the first few hours the 350 passengers and most of the crew were huddled on the decks and yes, the ship’s orchestra played—not “Nearer My God to Thee” but show tunes from Oklahoma. At about 4:00 AM we were all sent to lifeboat stations, and a few minutes later. the whole center of that ship erupted in flames, leaping 30 feet into the night sky. People pressed against the rails but jumping was out of the question—the water’s so cold in the Gulf of Alaska that it will kill you in minutes. Malory and I got to Lifeboat #2 and by a miracle, all the boats were lowered without accident. 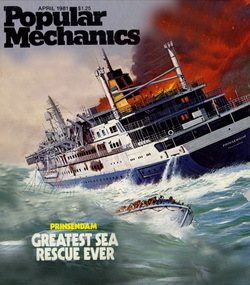 At dawn, helicopters arrived from shore bases 140 mile away and began lifting people off the lifeboats one by one, taking them to a nearby tanker that had answered the SOS. The seas were calm at dawn, but Typhoon Vernon was bearing down and the seas and winds began to rise. At about noon Malory was lifted off to safety. By 5:30 PM there only eight of us left in an open lifeboat. We were all dying of hypothermia. The typhoon was hitting us with 65-knot winds, stinging rain and thirty foot seas. Visibility was down to fifty yards. It was suicidal to fly a helicopter in that weather. Our only hope was for a Coast Guard cutter, searching somewhere out in that storm, to find us. We dry-heaved, bailed, and hung on. The key thing was the light. The Coast Guard cutter might spot our lifeboat in fading light even in the storm, but it would be dark in an hour and we had no lights and no flares and no radio. The possibility of our rescue was dropping from slim to nil. Hypothermia is insidious; at first you feel cold, then you start to feel strangely warm, then you go to sleep—and don’t wake up. We’d be dead by dawn. Still I had hope. I’d once counted that by the time I was 35 I’d come close to a violent death a dozen times, in the mountains I’d climbed or the wars and revolutions I’d been a part of. And I’d walked away, unscathed, from all of it. Now I wasn’t so sure. So I saw no reason not to hedge my bets. I wasn’t a religious person but, well, I decided to talk to God. It wasn’t a prayer. More an angry bleat. Why am I being wiped out? Hey, I helped end apartheid. I left the Foreign Service so I could devote myself to doing good in the world. It makes no sense to kill me now! I was beaten. And while I know it sounds like a Grade B movie, the truth is that the instant I looked up into the teeth of that storm and muttered, “OK,” the Coast Guard cutter Boutwell came crashing through that storm so dead on that if the lookout hadn’t seen us we would’ve been cut in two. Today, I run the Project’s global operations, which includes training political activists in places like Egypt and Zimbabwe where I’m usually just one step ahead of the security forces. So my adventures have not ended—what’s changed is my motive for taking risks. What’s important are not the risks you take but what you take them for. What I understand now is that the most crucial risks—the ones you have to get right—are in searching for and finding what makes your life meaningful, at the deepest level and at every age—and then going for it with everything you have.